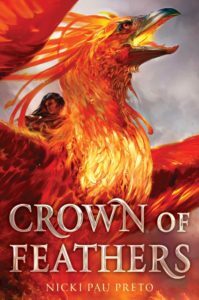 Crown of Feathers is a fiery debut. It’s a book full of mystery, intrigue, and sister relationships. Crown of Feathers is a book about sisters. It’s about relationship that form you. That break you. It’s a book about loyalty, about finding a cause to fight for, and people to form a community. I knew, based on that gorgeous cover, I would want to read this book. But when it was compared to Daine from Wild Magic, my favorite Tamora Pierce series, I knew I had to pick it up. I wasn’t disappointed. While there’s a lot of information, history, and mythology to get through (resulting in sections with lots of information), by the end you will be utterly sold. Rep in Crown of Feathers: a m/m romance, a bisexual MC, and an ace/aro character. I think the biggest thing that kept me reading Crown of Feathers is how intricate the sister relationship is between Veronyka and Val. Val is overbearing and protective, often lacking compassion. But she loves Veronyka, believing steadfast that everything she does is for the best – to protect her. And even though a lot of the things she does is flawed, Veronyka realizes this. Their relationship is based on give and take. And because of this, there’s this push and pull between them. It’s like when you have to constantly test the edge of the cliff, until you’re ready to jump off and fly. There’s something tender between them as Val feels this fierce protective instinct towards Veronyka, even if she has to betray her in order to do it. I was hooked from page one. It’s like one of those relationships where someone becomes a part of you, and even when you don’t like what they’ve done, they still remain with you after the embers burn out. There’s tenderness, fragility, hope, and naivety all in one relationship. It’s fraught and fragile. I think if you’ve had a sister, or wanted a sister, then reading Crown of Feathers becomes even more. Because as a reader, you can see the moment when a relationship breaks, when the strain becomes too much. We can see all the ways they mirror each other, break each other down, and make them stronger. Because what else is sisterhood really? Not only do you have Val and Veronyka, but the history of the sisters who ripped the world apart is slowly revealed. You see their letters and feel this similar push and pull. The light of one sibling. The burning fire of another. How even if they may want the same thing, their methods are night and day. And with many relationships, the balance is skewed. When Veronyka wants to exert more control over her life, she realizes how isolated they have been on their own. It’s not only Val and Veronyka who struggle with this, but the other characters like Sev too. The need for a cause, for a purpose, for a community is a universal one. It inspires revolutions, loyalty, and betrayal. We think we can go around protecting our heart. Stopping others from sacrificing for us because the pain of their loss is too much to bear. Especially for Sev who feels caught between the Empire and the animages. While he has the power of the animages (those who can bond with animals), he has been suppressing his ability to survive. So he feels trapped between these two groups understanding the ways both have pulled his family apart. Feeling like he belongs nowhere, Sev’s journey and growth is an understated, and important reason why I enjoyed Crown of Feathers so much. If I was a character in this book, I feel like I’d be someone like Sev, or maybe Tristan. There’s these world building passages between the chapters. Sometimes they’re mysterious quotes. Sometimes they’re documents. But they establish this rich history of rebellion and sisters that could tear the world apart with their love, their resentment, and secrets. And the world building doesn’t stop there. While there are sections that are incredibly information rich, by the end you realize that to have the big reveal, to care about the cause of the Empire and Phoenix Riders, you need it all. To understand the scope, the dangers, the risks, and the power of hope. You have to understand the rift that these sisters established. The ways power, corruption, and greed has fallen into the cracks. And all the innocent people who have fallen as collateral damage. Crown of Feathers is all of that and more. It’s a book about sisterhood, about community, about history, and choice. And on top of all that, Crown of Feathers talks about power. Is it better to command power or coax respect? Whether that be with our soldiers, our animal bonds, or our friends and family. I haven’t even talked about how much I liked the character of Tristan, another point of view, or the side characters of Kade and Trix. Crown of Feathers has a ton to offer readers in terms of scale, characters, and world. Find Crown of Feathers on Goodreads, Amazon, Indiebound & The Book Depository. What’s your favorite book with phoenixes in it?